Martin Luther’s hand-written inscription on the title page of a 1520 pamphlet was discovered by German scholar Ulrich Bubenheimer. Exhibit: "From Wittenberg to Atlanta: The Richard C. Kessler Reformation Collection at 30 Years"
Pitts Theology Library’s current exhibit highlights the library’s renowned Kessler Reformation Collection, recognizing the collection’s 30th anniversary as well as the 500th anniversary of the Protestant Reformation. The exhibit runs during regular library hours, and features the most significant pieces of the collection, which contains over 1,000 publications by Luther himself—more than any other library in the U.S. Guided tours will be held on Oct. 20, Nov. 3, and Nov. 17 at 1 p.m. For more information or to sign up for the tour, call 404-727-0645 or register online. Reformation Day at Emory: "Did the Reformation Fail?" The 30th annual Reformation Day at Emory will explore the question, “Did the Reformation fail?” Presenters include the Rev. Katherine Museus, associate pastor at St. Andrew Lutheran Church; the Rev. Julian Gordy, bishop of the Southeastern Synod of the Evangelical Lutheran Church in America (ELCA); the Rev. Dr. Larry M. Goodpaster, bishop-in-residence at Candler; and the Most Reverend Wilton Gregory, archbishop of the Roman Catholic Archdiocese of Atlanta. The event includes a luncheon musical program featuring the Candler Singers, and an evening Kessler Reformation Concert featuring the Emory University Chorus and Orchestra. View the full schedule and register online or call 404-727-6352. Pitts Theology Library at Emory University’s Candler School of Theology holds the largest collection of works by German theologian and Protestant Reformation founder Martin Luther in all of North America. 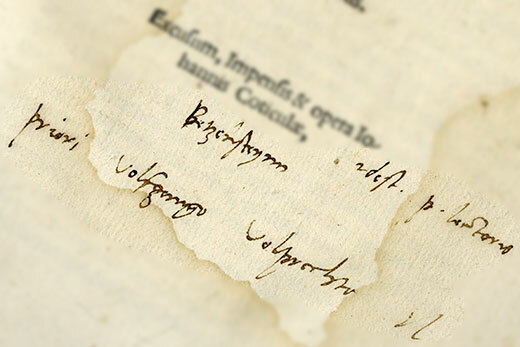 The acclaimed collection included one example of Luther’s handwriting, a manuscript note from late in Luther’s life. Thanks to Pitts Library’s digital archives, a second documented example of Luther’s handwriting has been spotted by a scholar from across an ocean. Ulrich Bubenheimer, a retired professor from Georg-August-Universität in Göttingen, Germany, and a leading expert on Luther, discovered this new example of Luther’s handwriting while working with a printed bibliography in Pitts Library’s Richard C. Kessler Reformation Collection. The three-line inscription appears on the title page of a 1520 pamphlet, author previously unknown. Bubenheimer’s discovery also helped identify the author of the pamphlet, which until now had been a subject of debate among scholars. Bubenheimer was working with the print bibliography, which includes images of the title pages of many Kessler works. He saw the inscription and suspected he was looking at Luther’s handwriting. He immediately emailed the library. “With the ease of digitization and dissemination, we were able to send Professor Bubenheimer higher resolution images, which he was then able to use to confirm his initial assessment,” says Adams. 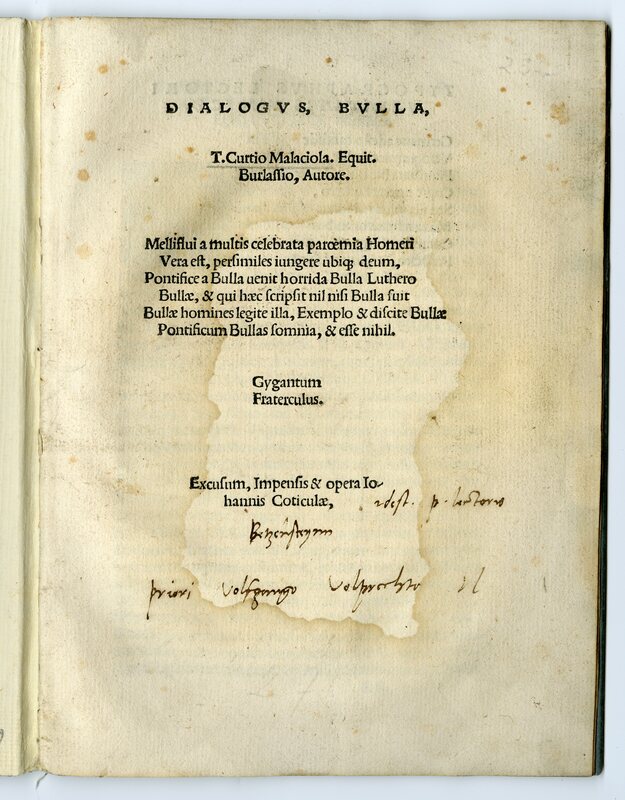 “I would like to inform you that the hand-written inscriptions on the title page are a previously unknown Luther autograph and that all three lines are written in Luther’s own hand,” Bubenheimer wrote. Bubenheimer translated and provided context for the three lines of the Latin inscription. The key line of the inscription is Luther’s explanation of who is the author of the work. The work itself is a mocking dialogue about the Pope’s decision to excommunicate Luther and was published under a pseudonym. In the inscription, Luther is writing to a fellow Augustinian prior, identifying the author as a companion of his. “As my colleague Armin Siedlecki [head of cataloguing for the library] likes to say, Luther basically says ‘Hey, this is written by one of us!’” says Adams. “With the identification of the inscriber, your library has been enriched by a Luther autograph,” wrote Bubenheimer. With Pitts Theology Library no longer limited to issuing print versions of these rare 16th century documents, online access allows anyone with expertise like Bubenheimer to help unearth new findings, says Adams. On Oct. 31, 1517, Luther published his Ninety-five Theses, a series of statements about the power of indulgences and the nature of repentance, forgiveness and salvation, generally seen as the beginning of the Protestant Reformation. Pitts Library’s current exhibit, titled “From Wittenberg to Atlanta,” marks the 500th anniversary of the Protestant Reformation and the Kessler Collection's 30th anniversary. It includes Luther's final authorized edition of the Ninety-five Theses in book form with his own commentaries, as well as the first printing of Luther’s translation of the New Testament from the original Greek into German, printings of the 1530 Augsburg Confession, the first published edition of Erasmus’s Greek New Testament, a 15th-century Book of Hours, and illuminated medieval manuscript leaves. The exhibit runs through Nov. 27. and chronicles how these incredible print treasures came to Atlanta in physical form. “This episode reminds us of our responsibility to spread access to these documents digitally around the world,” says Adams.